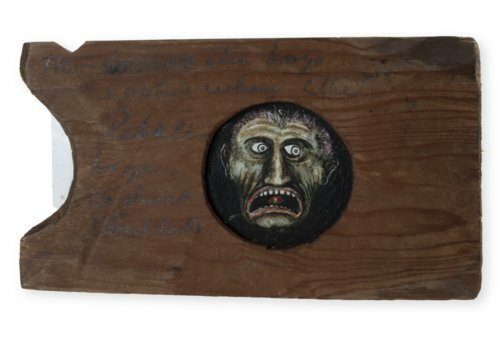 This is a hand painted lanternslide depicting the face of a frightened man, his mouth hanging open in a frown, inside a handmade wooden frame. The slide can be manipulated so the man's eyes and tongue move from left to right. Part of a collection made by Samuel James Reader documenting his experiences in the Civil War, showing "How some of the boys / looked when the / Rebels / began to shoot bullets" at the Battle of the Big Blue on October 22, 1864. Samuel was a soldier in the 2nd Kansas State Militia, and kept a diary that included his experiences at this battle and as a prisoner of war. Reader was an early settler in Kansas, building his own home just north of Topeka. He began painting slides in 1866 and continued throughout much of his life, holding magic lantern shows with the local community by putting on slide shows in his house or at church.